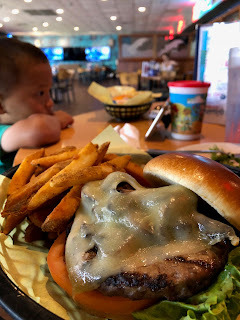 The boys and I had the day off from school/work on Monday since it was a state holiday, so we decided to have lunch at Kahuna's Sports Bar & Grill at the Marine Corp Base Hawaii. 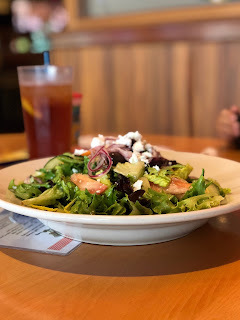 We got to sample a couple of new menu items - the "it's greek to me" salad, a good option for those looking for something healthy, so long as you ask for the dressing on the side. Another new menu item we got to try was the beef quesadilla burger. 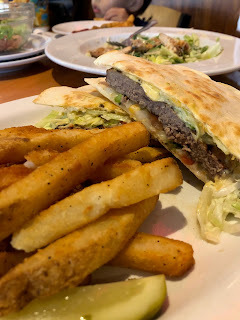 Apparently quesadillas are a popular menu item at Kahuna's, so the manager thought it would be fun to try it with a hamburger, instead of the usual chicken. Very innovative! For my lunch I ordered my usual - Mushroom Swiss burger. It never disappoints. 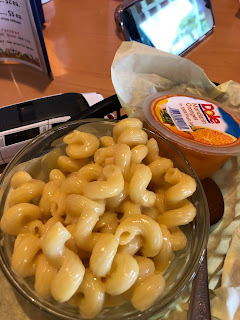 The twins usually never want to eat the same thing, so one ordered the mac n cheese with mandarin oranges. 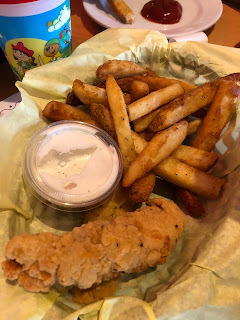 The other one ordered chicken strips with french fries. Click HERE to see their current menu!